DeMaegd, M. L., Städele, C. and Stein, W. (2017). Axonal Conduction Velocity Measurement. Bio-protocol 7(5): e2152. DOI: 10.21769/BioProtoc.2152. Städele, C. and Stein, W. (2016). The site of spontaneous ectopic spike initiation facilitates signal integration in a sensory neuron. J Neurosci 36(25): 6718-6731. Action potential conduction velocity is the speed at which an action potential (AP) propagates along an axon. Measuring AP conduction velocity is instrumental in determining neuron health, function, and computational capability, as well as in determining short-term dynamics of neuronal communication and AP initiation (Ballo and Bucher, 2009; Bullock, 1951; Meeks and Mennerick, 2007; Rosenthal and Bezanilla, 2000; Städele and Stein, 2016; Swadlow and Waxman, 1976). Conduction velocity can be measured using extracellular recordings along the nerve through which the axon projects. Depending on the number of axons in the nerve, AP velocities of individual or many axons can be detected. This protocol outlines how to measure AP conduction velocity of (A) stimulated APs and (B) spontaneously generated APs by using two spatially distant extracellular electrodes. Although an invertebrate nervous system is used here, the principles of this technique are universal and can be easily adjusted to other nervous system preparations (including vertebrates). Long-distance communication in the nervous system is mediated by APs that travel along axons. The ionic currents that flow across the axon membrane when an AP is generated (Hodgkin and Huxley, 1952) can be detected even outside of the neuron, using extracellular recording electrodes. AP conduction velocities in different neurons are quite variable and range from 200 meters per second (447 miles per hour) to less than 0.1 meters per second (0.2 miles per hour) (Kress et al., 2008; Kusano, 1966). In order to understand why there are differences in conduction velocity, the passive (membrane) properties of the axon need to be taken into account. Some axons propagate information more rapidly than others because of differences in properties that affect the time constant (e.g., resistance and capacitance) and the length constant (e.g., axon diameter, membrane permeability, and degree of myelination). Especially in unmyelinated axons, conduction velocity largely depends on the axon diameter, which in turn is also correlated with the amplitude of the extracellular AP (Stein and Pearson, 1971). Consequently, determining AP conduction velocity provides more than just information about signal movement and timing. It can also be used to characterize changes in intrinsic axon properties. Note: The materials and equipment listed refer to the equipment used in Städele and Stein (2016). To reduce costs, comparable materials, equipment and software may be used that serve the same functions. For the general public or a teaching classroom we suggest utilizing equipment from Backyard Brains (http://backyardbrains.com). Note: For details how to prepare the petroleum jelly filled syringe or recording/stimulating electrodes, see our companion protocol ‘Extracellular axon stimulation’ by Städele, C., DeMaegd, M. and Stein, W.
Note: We are using adult Jonah crabs (Cancer borealis), purchased from The Fresh Lobster Company (Gloucester, MA). Low-cost alternative: by using the BYB Spike Recorder, data can be digitized by using the microphone jack and soundcard on a computer/laptop. A second low-cost alternative is Spikehound (http://spikehound.sourceforge.net), which also allows recording through the computer soundcard. ∆t as the time difference between recording sites (latency). Figure 1. Representation of the electrode placement for measuring conduction velocity of stimulated APs (A) and spontaneously generated APs (B & C). A. Left: APs are initiated within the stimulation well and propagate along the axon (green arrows) towards the recording well. Note that APs propagate bi-directionally but are only detected at the recording site. Δx represents the distance between the stimulation and recording wells. Right: Extracellular recording of a nerve showing the latency (Δt) between the onset of the stimulation (stim. artifact) and the AP (gray box). B. Left: Correct electrode placement for measuring conduction velocity of spontaneously generated APs. Recording wells need to be placed in such a way that the AP is passing the wells without being initiated in-between the wells. Right: The latency in AP occurrence at the two recording sites reflects the time the AP needs to propagate from recording 1 to recording 2. C. Left: Incorrect electrode placement for measuring conduction velocity of spontaneously generated APs. Right: The latency between the two recording sites is small and it only reflects that the AP was initiated spatially closer to recording 1 than to recording 2. The advantage of measuring conduction velocity of stimulated APs is that AP initiation is controlled by the experimenter. Thus, different AP frequencies can be tested, and APs can reliably be elicited in many different conditions (e.g., at different temperatures or in distinct neuromodulatory conditions). However, because the largest axons respond to the lowest stimulation amplitudes, measuring the velocities of small diameter axons may not be feasible with extracellular stimulation. Dissect the nerve of interest. Note: The dissected nerve should be long enough that the two wells constructed in step 2 are separate, and the entire length of the nerve contains the axon of interest. For a detailed protocol how to dissect the stomatogastric nervous system of C. borealis please review Gutierrez and Grashow (2009). Establish the extracellular recording and stimulation as described in companion protocol ‘Extracellular axon stimulation’ by Städele, C., DeMaegd, M. and Stein, W. For electrode placement see Figure 1A. After determining the AP stimulation threshold, continuously stimulate the axon with a low frequency stimulation (1 to 2 Hz). Identify the AP on the extracellular recording (Figure 1A, right). Note: The stimulated AP will travel from the stimulation electrode to the recording site. From one stimulus pulse to the next, AP amplitude and shape should not change. Similarly, the latency between the stimulation onset and the AP occurrence should remain constant. If there is no consistency of AP amplitude or latency, then either no AP was elicited or the elicited AP does not pass the recording site, indicating that the axon might be damaged or might project through a different nerve. Measure conduction velocity as described in Data analysis. Variation of the experiment: In many axons, AP conduction velocity is frequency-dependent (Miller and Rinzel, 1981; Weidner et al., 2002) and/or history-dependent (Ballo et al., 2012; Kiernan et al., 1997). To test whether this is the case for the axon of interest, increase the stimulation frequency and observe whether conduction velocity changes as a function of frequency and/or number of APs. Instead of stimulating at a constant frequency, more biological relevant pulse sequences may be applied, such as burst-like changes in frequency (Ballo and Bucher, 2009). Conduction velocity measurements of spontaneously initiated APs does not require extracellular nerve stimulation. Many axons spontaneously generate APs, and accordingly, most nerve recordings show spontaneously occurring APs. By using spontaneously generated APs, the conduction velocities of small diameter axons can be assessed. However, the occurrence and frequency of the APs cannot be controlled by the experimenter. We are using the anterior gastric receptor neuron (AGR; Smarandache and Stein, 2007) of the stomatogastric nervous system of the Jonah crab (Cancer borealis) as an example. AGR spontaneously generates tonic spike activity (2 to 5 Hz) in its axon trunk that can be measured with extracellular electrodes (Daur et al., 2009; Städele and Stein, 2016). Dissect the nerve of interest. Then, instead of one stimulation and one recording well, both will be used as recording wells (Figure 1B). Connect the cable of the stimulation electrode to a second channel of the extracellular amplifier. Note: If the neuron of interest is bipolar or able to generate ectopic APs (e.g., Daur et al., 2009), make sure that the site where APs are initiated is not in between the two recording wells since the measured latencies will not reflect travel times between recording sites (Figure 1C). If necessary, this can be determined by adding a third recording well. The order at which the APs arrive at the recordings wells will be indicative of the initiation site. If either of the two outside wells records the AP first, the correct velocity can be measured using the difference in arrival times between the other recording wells. If the center well records the AP first, use longest latency between center and outside wells. Identify the AP of interest on the extracellular recordings. Note: The AP of interest should appear with a constant latency between both recording sites. Its shape and amplitude may differ between recording sites, but should be consistent for each site. If the AP of interest is not the largest unit on the extracellular recording, or difficult to identify for other reasons, see Notes. Measure the latency between AP occurrence at the two recording sites. For stimulated APs, measure the time difference between stimulus and recorded AP, as illustrated in Figure 1A. Note: Stimulation onset can be determined using the stimulus artifact, which spreads almost instantaneously through the Petri dish. In the recording software, measure the time between the peak of the stimulus artifact and the peak of the recorded action potential. For spontaneously elicited APs, measure the time difference between the peaks of the AP at recording 1 and recording 2, as illustrated in Figure 1B. Measure the distance between recording sites. Put a size standard underneath the Petri dish (e.g., micrometer scale). Take a photo that shows the distance between the stimulation and recording well plus the size standard. Use ImageJ (National Insitute of Health) or a comparable software to measure the nerve distance between the two wells. Use the size standard to calibrate the distance measurement in the software. Calculate the conduction velocity using Equation 1. Note: For more accurate results, calculate, then average the conduction velocities of at least 10 APs. Use a paired t-test when comparing conduction velocities in two different conditions (e.g., before and after neuromodulator application) from the same preparation with a significance cut off value of P < 0.05. Using multisweeps and averages to increase measurement accuracy. To measure the latency between stimulus artifact and recording (or between recording 1 and recording 2), it is helpful to not only use single APs. Rather, multiple APs should be taken into account (Video 1). This will not only make the identification of time-correlated APs easier, but also allows to assess variability and changes in conduction velocity that may occur in different conditions. Time-correlated APs are most easily detected using a triggered sweep display (oscilloscope view, or ‘multisweep’, Video 2). 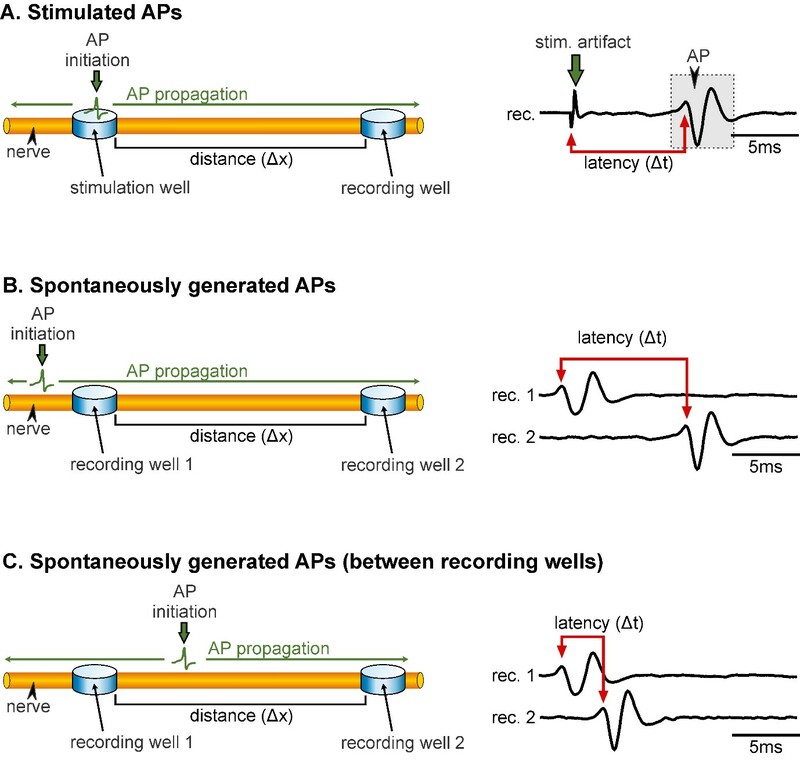 In this view, multiple occurrences of the same AP are superimposed to show APs that occur at a fixed latency to the stimulation or the other recording, respectively. For this, an amplitude threshold is set in the software, through which the AP must rise to start a new sweep (‘triggering’). Consequently, only APs large enough to cross the threshold trigger new sweeps, and the latency of arrival of these APs at the recording site becomes obvious. If the threshold is set lower, APs of multiple axons may be detected. Depending on their conduction velocity, they may arrive at distinct, but fixed times at the recording. The APs of other axons will not be time locked to the trigger and hence occur randomly on the display. Using a triggered sweep display is particularly helpful to detect spontaneously generated APs, since it is difficult to determine time correlations between two recording sites using individual APs or without proper analysis. To determine the exact latency, it can be helpful to average several sweeps of triggered APs (Video 2). In this case, all randomly occurring APs will be small or absent, and only the time-locked APs show a clear peak that can easily be measured. Video 1. Video clip illustrating time-correlated APs using Spike recorder software (Backyard Brains) for spontaneously generated APs. A similar procedure can be used for stimulated APs. Video 2. Video clip illustrating spike-triggered multisweeps and averaging using Spike 2 software (CED) for spontaneously generated APs. A similar procedure can be used for stimulated APs. Noise issues. Electrical noise is a common problem associated with the recording of neuronal signals. The major source of electrical noise is pickup, which is caused by radiation from electrical devices and the recording equipment. This radiation produces currents in the electrodes and wires leading to the amplifiers in the recording system. Since most devices are powered by 60 Hz (US)/50 Hz (most other countries) alternating current, pickup appears as a distorted sine wave with a period of 16.7 (US)/20 (others) milliseconds. Noise may be reduced by using a grounded, metal enclosure (Faraday cage) around the preparation and the electrodes. The enclosure separates the source of the radiation from the electrodes. Grounding all recording and stimulation equipment to a single source will reduce noise. This can be done using a banana plug with a crocodile clamp on one side to connect the ground ports of the recording and stimulation equipment to the Faraday cage. For more information on the principles of Faraday cage function, see Chapman et al. (2015) and DeFreitas et al. (2012). The person operating the equipment might also be a source of noise, and he or she may need to be grounded as well. Additionally, shielded cables may be used to carry the signals from the electrodes to the amplifier. If the signal-to-noise ratio is still small, the issue might originate from a small signal rather than large noise. In this case, the recording well is likely leaky and should be remade. Note: Adjust pH to 7.4-7.6 with Trizma base and maleic acid. This work was supported by grants from the Deutsche Forschungsgemeinschaft (DFG STE 937/9-1), National Science Foundation (NSF IOS 1354932), Illinois State University, and the German Academic Exchange Service. Ballo, A. W. and Bucher, D. (2009). Complex intrinsic membrane properties and dopamine shape spiking activity in a motor axon. J Neurosci 29(16): 5062-5074. Ballo, A. W., Nadim, F. and Bucher, D. (2012). Dopamine modulation of Ih improves temporal fidelity of spike propagation in an unmyelinated axon. J Neurosci 32(15): 5106-5119. Bullock, T. H. (1951). Conduction and transmission of nerve impulses. Annu Rev Physiol 13: 261-280. Chapman, S. J., Hewett, D. P., and Trefethen, L. N. (2015). Mathematics of the Faraday cage. Siam Review 57(3): 398-417. Daur, N., Nadim, F. and Stein, W. (2009). 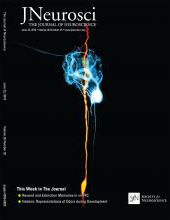 Regulation of motor patterns by the central spike-initiation zone of a sensory neuron. Eur J Neurosci 30(5): 808-822. DeFreitas, J. M., Beck, T. W., and Stock, M. S. (2012). Comparison of methods for removing electromagnetic noise from electromyographic signals. Physiol Meas 33(2): 147-159. Gutierrez, G. J. and Grashow, R. G. (2009). Cancer borealis stomatogastric nervous system dissection. J Vis Exp (25). Hodgkin, A. L. and Huxley, A. F. (1952). A quantitative description of membrane current and its application to conduction and excitation in nerve. J Physiol 117(4): 500-544. Kiernan, M. C., Mogyoros, I., Hales, J. P., Gracies, J. M. and Burke, D. (1997). Excitability changes in human cutaneous afferents induced by prolonged repetitive axonal activity. J Physiol 500 ( Pt 1): 255-264. Kress, G. J., Dowling, M. J., Meeks, J. P. and Mennerick, S. (2008). High threshold, proximal initiation, and slow conduction velocity of action potentials in dentate granule neuron mossy fibers. J Neurophysiol 100(1): 281-291. Kusano, K. (1966). Electrical activity and structural correlates of giant nerve fibers in Kuruma shrimp (Penaeus japonicus). J Cell Physiol 68(3): 361-383. Meeks, J. P. and Mennerick, S. (2007). Action potential initiation and propagation in CA3 pyramidal axons. J Neurophysiol 97(5): 3460-3472. Miller, R. N. and Rinzel, J. (1981). The dependence of impulse propagation speed on firing frequency, dispersion, for the Hodgkin-Huxley model. Biophys J 34(2): 227-259. Rosenthal, J. J. and Bezanilla, F. (2000). Seasonal variation in conduction velocity of action potentials in squid giant axons. Biol Bull 199(2): 135-143. Smarandache, C. R. and Stein, W. (2007). Sensory-induced modification of two motor patterns in the crab, Cancer pagurus. J Exp Biol 210(Pt 16): 2912-2922. Stein, R. B. and Pearson, K. G. (1971). Predicted amplitude and form of action potentials recorded from unmyelinated nerve fibres. J Theor Biol 32(3): 539-558. Swadlow, H. A. and Waxman, S. G. (1976). Variations in conduction velocity and excitability following single and multiple impulses of visual callosal axons in the rabbit. Exp Neurol 53(1): 128-150. Weidner, C., Schmelz, M., Schmidt, R., Hammarberg, B., Orstavik, K., Hilliges, M., Torebjork, H. E. and Handwerker, H. O. (2002). Neural signal processing: the underestimated contribution of peripheral human C-fibers. J Neurosci 22(15): 6704-6712.